I found this spider lurking in my Compost Bin yesterday, 11th April, 2019. When I removed the lid I found a huge web covering the compost, not the usual neat spun web, it resembled a fine mesh, like cheesecloth, with a large hole in the middle that a broom handle would fit it. (First thought: Funnel Web, but wrong side of the world.!) I didn't see the spider until I started to remove the web with a stick, it scurried up into a large scoop stuck in the compost. I lifted it out carefully, set it on my garbage bin and dashed in for my camera. When I came out it had disappeared, but it had moved out of the scoop and was hiding underneath it. So I got my photo. 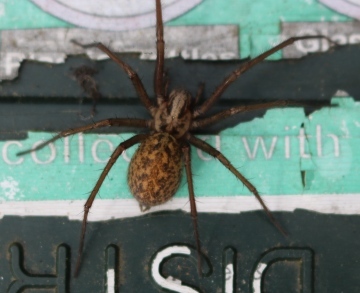 I sent a copy to Martin Bailey of Wildlifeservices.co.uk for an ID, and he sent me this reply: It’s one of the “Large House Spiders” – either Eratigena duellica or Eratigena saeva (the two can hybridise too and are difficult to separate even microscopically). I have never seen a spider like this one before, it has very pretty markings. I live in the rural hamlet of Little Barugh, North Yorkshire.